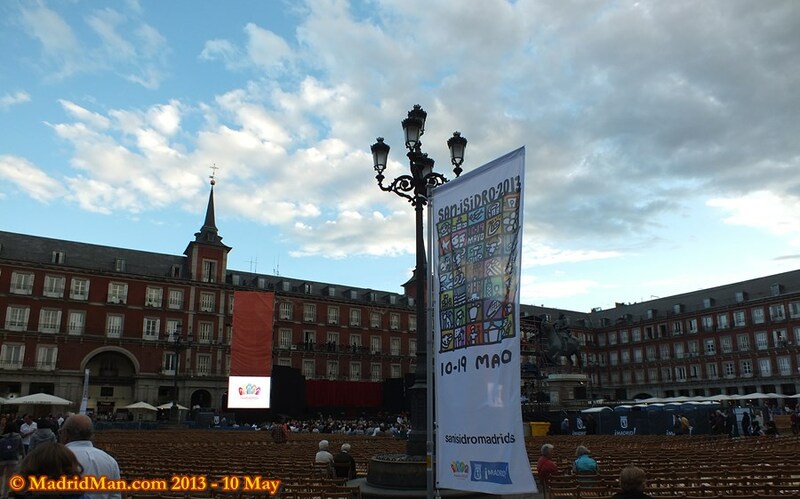 Yesterday, the 10th of May, was the official start of the 10-day 2013 Madrid San Isidro Festival and it lasts until the 19th of May. The 15th of May is THE BIG DAY, San Isidro Labrador Day, Madrid’s Patron Saint, and is a city-wide holiday. I know many people hear “San Isidro” and first think of the world’s largest bullfight festival, “Fería de San Isidro“, with daily bullfights from 9 May to 1 June. But Madrid’s San Isidro festival is much more diverse than that. In the Pradera de San Isidro on the 15th of May, Catholic Mass takes place at noon and costumed “chulapas” (women) and “chulapos” (men) dance the traditional “el Chotis” in the street throughout the day. There will also be people standing in line for hours to drink the spring water beside the “Ermita de San Isidro” hermitage – which is said to contain “healing powers”. I always go the day before the 15th to drink the same water and there’s never a line – but it’s not the same as doing it ON San Isidro Day, I realize. Thousands of people will also buy “rosquillas” (kind of like doughnuts) – “las tontas, las listas y las de Santa Clara” to eat there and to take home. I always get a “mixed bag” of the three kinds to eat for “merienda” and breakfast over the following days after San Isidro. 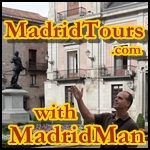 There are also other cultural events, dances, and concerts taking place in Madrid’s “Las Vistillas“, the small park south and west the Viaducto. I tend to only attend events in the “Pradera de San Isidro” as it’s practically in my neighborhood and access is easy onfoot. These days it’s impossible to find parking anywhere in this area. This year, 2013 Madrid San Isidro Festival, on the 15th of May itself, I’ll post a new blog with photos and video of my experiences in the Pradera – assuming it doesn’t rain, that is. Enjoy the 2013 Madrid San Isidro Festival! This entry was posted in About Spain, Entertainment, Food, Photos and tagged 2013, bullfights, ermita, ermita de san isidro, events, feria, feria de san isidro, fotos, Las Ventas, las vistillas, Madrid, photos, Pradera, pradera de san isidro, san isidro, San Isidro Labrador, toros, Video. Bookmark the permalink. ok so so how it went on the 15 of May?, and of course the bulls keeps running lol! Hello, Great blog, MadridMan. I am traveling to Madrid tomorrow and have never been this excited 🙂 ! Thanks for the awesome blog, the more I read your articles the more I fall in love with the city. Thank you for your kind words about my blog, Zaid. 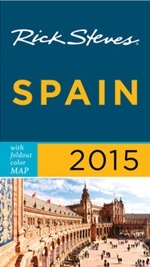 Hope you have an enjoyable visit to Madrid! I would never go to Spain because you still have barbaric, ugly, brutal bull massacres i.e. so called “bull fights” (and absurd running of the bulls – ridiculously reckless, cruel in the name of tourism) – Tormenting bulls is far from honourable or “macho” or skilfull. It’s unethical, hideous torture and slaughter of an animal FORCED to be in a ghoulish ring with an idiotic man in a cape taunting this innocent animal to charge him, whilst a sadistic man on a horse sticks swords into this innocent animal… and then the idiotic man in the cape wonders why just occasionally the bull responds to this histerical taunting and actually charges this tormentor and maybe gores or kills him and then of course this poor animal is slaughered for doing so. SICK SICK SICK – supposed to be a sophisticated country – such treatment of animals does not represent a progressive, honourable, humane, thinking country.